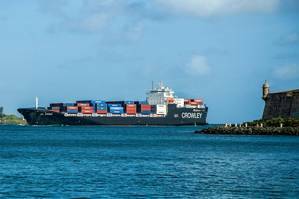 Crowley Maritime Corp.'s new container/roll on-roll off (ConRo) ship El Coquí delivered its first cargo from Jacksonville, Fla., to the company's Isla Grande Terminal in San Juan yesterday - a milestone in the company's transformation of its U.S. mainland-Puerto Rico logistics services. "Increasing supply chain velocity while reducing customers' landed costs was the core reason for our $550 million investment in this important service," said Tom Crowley, company chairman and CEO. "Bringing this new ship, and soon its sister ship, to reality is one of the final steps to making this vision a reality. It should be evident to all that our commitment to Puerto Rico could not be stronger." "The diverse cargo carrying capabilities, as well as the ability to carry in-demand 53-foot containers, means that these high-performing ships will greatly benefit customers shipping goods between the mainland and the island," said John Hourihan, senior vice president and general manager, Puerto Rico services. "Cargo for businesses and consumers will be able to dependably reach markets at peak time, whether it is dry, refrigerated or breakbulk, such as vehicles and other rolling stock." El Coquí, one of the world's first ConRos powered by liquefied natural gas (LNG), departed Jacksonville on Friday night and arrived in San Juan Monday. The ship has a cruising speed of 22 knots and can carry about 2,400 TEUs (twenty-foot equivalent units) of containers in a wide range of sizes and types - including 53-foot by 102-inch-wide, high-capacity containers and refrigerated containers. Within the ship is an enclosed, ventilated and weather-tight Ro/Ro deck that can protectively carry up to 400 cars and larger vehicles. This type of shipboard garage is offered exclusively by Crowley in the trade, enhancing supply chain solutions for customers. Besides full-loads of dry cargo containers, the inaugural cargo also included various equipment and automobiles, trucks and SUVs, as well as refrigerated "reefer" containers for produce. "We have eagerly anticipated this initial port call for some time now, and very much look forward to the added speed and efficiency that this high-performing ship will add to our customers' supply chains," said Frank Larkin, Crowley's senior vice president and general manager, logistics and commercial services. "The ship's reduced transit time complements major investments in technology and other infrastructure upgrades to our terminals that make it easier and quicker for our trucking partners to access our terminals for cargo moves. We've also evolved our warehouse operations to bring greater efficiencies all the way through to final mile deliveries. We've created greater speed to market all the way around." "This momentous occasion marks yet another milestone in our historic Commitment Class project, which ultimately offers shippers faster and more efficient logistics services that will match the needs of consumers and businesses in Puerto Rico," said Jose "Pache" Ayala, vice president, Puerto Rico services, in San Juan. Monday's arrival continues a series of milestones that are now enhancing Crowley's capabilities in Puerto Rico. In San Juan, Crowley is utilizing three new, ship-to-shore gantry cranes, at Crowley's Isla Grande Terminal to add speed to vessel unloading. The cranes are the first new, specialized gantry cranes to be received for operation in San Juan Harbor in more than five decades. The cranes complement new 900-foot-long, 114-foot wide concrete pier at Isla Grande. In addition, Crowley has expanded Isla Grande's terminal capacity for handling refrigerated containers; paved 15 acres to accommodate container stacking; added containers and associated handling equipment to its fleet; installed a new electrical substation to provide power for the new gantry cranes; constructed a new seven-lane exit gate to increase speed and efficiency for trucking partners; and implemented a new, modern terminal operating software system (TOS) to modernize and enhance cargo deliveries and exchanges. With the TOS in place, terminal employees now work from an indoor gate-control center, more efficiently and safely interacting with truck drivers from kiosks via communication handsets and cameras. This operation is also paperless, which reduces gate-lane transaction times. The technology ultimately allows trucking partners to access and depart Crowley's terminal faster, avoid costly penalties and make more trips per day, putting cargo into the hands of customers faster. At Crowley's Isla Grande port facility in San Juan, the time it took a trucker to bring a container into the terminal (ingate) before the implementation of TOS averaged 45 minutes. Today, the time required is only 12 minutes. Time spent at gate kiosks also previously averaged six to seven minutes, and now it takes less than one minute. And gate-to-gate turn times are now averaging only 30 minutes. The investments complement Crowley's logistics services on the island, including warehousing, consolidation and deconsolidation, trucking and cross-docking, and more.